When you’re looking for a fun way to spend time with your family and friend, karaoke is a great solution and the Memorex MKS-SS2 SingStand 2 will impress everyone. A karaoke machine for the new era, SingStand 2 is compatible with all the latest gadgets and its elegant, professional design paired with great performance make it stand out even from much pricier competitors. Designed to look like a professional microphone stand, Memorex MKS-SS2 is the best karaoke machine made for the 21st century. With a built-in cradle and universal line-in, your favorite karaoke songs are just a few swipes away, on your smartphone, tablet or iPad. The built-in speakers deliver high-quality radios and with the ability to connect two microphones or even an instrument to accompany you, this karaoke machine makes most others feel like toys. Sleek design and abundance of additional features aren’t the only things that make Singing Machine iSM1030BT. This karaoke machine has unparalleled compatibility with other devices- from reading CDs and MP3s to wirelessly streaming songs from your phone- Singing Machine iSM1030BT can do it all. With the built-in speakers, two microphones, and a 7” color LCD display, this karaoke machine will sure be a hit of your next party. Anyone who thinks you can’t have a blast with a budget karaoke machine never tried SML388W. This karaoke machine, the Singing Machine SML388W, looks like its high-end competitors, and although it lacks some features of more expensive ones, it still delivers a great performance and it certainly won’t disappoint. How can I find karaoke songs for my machine? Having a karaoke machine can be a great way to have a fun afternoon with your family, bring some life to parties or just relax and let your inner rockstar emerge. Whatever your original intention is, trust me, a karaoke machine will find its way to becoming an irreplaceable gadget in your arsenal, one way or another. With advances in technology, it’s only logical that companies which produce karaoke machines started implementing more modern features and smart designs into their karaoke machines. Instead of simplistic plugging to a TV and loading a special karaoke CDs, many karaoke machines now offer a range of different possibilities- from adding effects to your voices to recording it on memory cards and CDs. In the age in which smartphones and tablets have become an essential part of our everyday lives, a karaoke machine which is compatible with these devices enables you to have everything you need at the tip of your fingers. The age of searching and (over)paying for special karaoke CDs is way behind on the industry standard, and most reputable manufacturers rely on the popularity of different karaoke apps and video streaming sites like YouTube to be the force behind their machines. This way, a karaoke machine is a hassle-free, foolproof way to make your get-togethers and parties more fun and interesting or bring the entertainment to your household. To make sure you’ll be getting your money’s worth and to find a machine that will be the best fit for your own individual needs, you should check a couple of things first before you decide on a purchase. First of all, determine why will you need it. For example, you’re looking a karaoke machine for your kid, you should go for quality ones with interesting features, like colorful design or flashing lights. Kids love karaoke machines and the ones that are sparkly or in their favorite color will be an amazing gift. On the other hand, if you’re looking for something more professional, check out the karaoke machines with voice effects and quality sound, and you won’t be disappointed. And, if you’re looking to be the life of the party, go for models with multiple microphones and easy portability- that way you can have fun with your friends and easily take your karaoke machine with you. When it comes to the universally important features, the first thing you should look up is the music source of the machine. If you already have an extensive karaoke CD collection with your favorite music hits, a smartphone-only compatible karaoke machine won’t do you any good. And, it makes sense that you wouldn’t want to waste money on CDs if you can access karaoke music from an app or a website, so for some people, karaoke machine compatible with smartphones and tablets take the win. The best option is to decide on a machine that has multiple options- both for CDs and modern devices. Next thing you should determine is where will you use your karaoke machine. Will you be using it in your living room, singing your heart out to your favorite song? Or do you plan on taking it with you to parties and social gatherings? According to the setup you need, choose a karaoke machine that will work best for your needs, be that for a TV-connected home entertainment or a portable and light fun on the go. And, in the end, you should always look for hidden costs. Karaoke machines that are compatible with expensive memory chips only, or without a microphone included might prove to be more expensive that you previously imagined. Make sure karaoke machine comes with all the accessories included or that the additional components, if you need to buy them, won’t strain your budget. Depending on the music source of your karaoke machine, you’ll find karaoke songs either in CD stores or online, through apps and websites. Karaoke disks are in CDG, VCD, and Karaoke DVD format, and most karaoke machines support them. The ones without an included CD-drive rely on data from external devices such as Android smartphones, iPhones and tablets and iPads. To find karaoke-compatible music through these devices, you’ll have to download an app of your choosing or find karaoke music videos on sites like YouTube. Using karaoke machines compatible with modern devices holds many advantages- not only that the apps are either free or very cheap, it’s much easier to find music you like than browsing through karaoke section in your music store. However, a lot of people have extensive collections of karaoke CDs, especially if they owned one before smartphones and tablets became all the rage. Thankfully, a lot of manufacturers recognize this and still include a CD drive in their karaoke machines, along with the option of connectivity with modern devices, to ensure every user will get just what they need. Karaoke machines are often perceived as a fun hobby for amateur singers and a way to have some fun in the local pub or at your friend’s party. Sure, they are a lot of fun and can be incredibly entertaining to both amateur singers to professional shower singers (a.k.a everyone), but it doesn’t mean they should be low quality, toy-like devices. A good karaoke machine will have professional features and top-notch quality, all within the range of an affordable price. But, is this realistic to expect? We wanted to find out, so we tested 10 different models of karaoke machines, for over 30 hours. We admit, it was incredibly fun, but we take matters seriously when it comes to our testing, so we were able to differentiate average karaoke machines from those who are truly remarkable. • Good connectivity. We wanted our karaoke machine of choice to cater a wide scope of users, and to be able to offer both splendid music source compatibility and to be easily plugged in with the majority of devices. • Crisp sound and great performance. It didn’t matter if a karaoke machine was compatible with every device on the planet if its performance turned out to be quite poor. We wanted to find a karaoke machine that has great sound, good volume and that will offer exceptional quality to its user. • Additional features. Disco lights, LED displays, and wireless microphones aren’t the only perks a karaoke machine can offer. Models offering additional features like the ability to record your performance, enhance your voice or even add backup vocals while you’re singing were awarded bonus points. The Memorex MKS-SS2 SingStand 2 proved to be quite a gem during our testing. Considering the price, we were pleasantly surprised as soon as we laid eyes on this karaoke machine- it has impeccable, high-end design, and looks like it belongs in an uptown music studio, not someone’s living room. Different from the majority of models we tested, SingStand 2 is designed to make you feel like you’re on a stage. It looks like a microphone stand, but with a twist- its base is actually a combination of high-quality speakers and control board. This karaoke machine includes one microphone, but, if you decide you’ll need two for those breathtaking duets, you can buy an additional one for a very low price which is a bargain, and since it supports two microphones, you’ll be able to sing with your bestie, but that’s not all. One of the things that sets SingStand2 apart from its competition is that you can plug in instruments, like a keyboard or a guitar, and have real live instrumental accompaniment while you sing. Not everyone wants to show off their vocal skills, but if you have that one friend who’s a guitar virtuoso in making, you’ll be able to include them, and have a rocking performance at that. The stand itself is quite sturdy and professional-looking, and the cradle at the top securely fits both smartphones and tablets or iPads without having to worry they’ll slip out or knock over the stand. That brings us to the music source of this karaoke machine- it’s completely dependent on your smartphone or tablet since the only way to get karaoke music is through an app or by streaming from YouTube. This offers a lot of possibilities and makes finding music an easier and less expensive task. Just to give you an example, in case you don’t find what you need on YouTube, or in a free app, you can find a paid one and enjoy virtually limitless choice. One of our favorites is the Red Karaoke app from Apple, and you can choose from over 40,000 different songs to sing along with. Considering that the average price per karaoke CD is around $10, you’ll get roughly 1,000 times more music to choose from when you use an app instead of buying karaoke CDs, which will save you both time and money. Although SingStand 2 doesn’t have the option of recording your performance integrated by default, you can actually bypass this since it’s smart device-dependent, because a lot of karaoke apps, in addition to providing music, offer the option of recording your performance. When it comes to the quality of sound, SingStand 2 didn’t disappoint. The sound from two 5-watt speakers was clear and crisp, without irritating background noise and crackling, and the speakers were fairly loud. Although, if you turn up the volume of the speaker to the highest level, the quality starts to drop, but even with moderately high volume, it’s still loud enough. We especially loved built-in auto voice control which amplifies your own voice, so the need for cranking up the volume is almost non-existent. You’ll also have the option to dynamically adjust the volume and add an echo effect to your voice, which is a fun feature. This karaoke machine includes one microphone, microphone cord, 11-inch line-in cord, 7-inch line-in cord, and cord management clip, so you’ll be able to connect your devices and enjoy your performance without a problem. However, if you think your iPad or smartphone’s display aren’t big enough for you to easily read the displayed lyrics, you can always hook up SingStand 2 to your TV and enjoy the big view. If you have a TV with the USB adapter in the back, you can easily connect the SingStand 2, but if you have a model without this adapter, you can buy Chromecast adapter or an appropriate cable for a few bucks. Considering how well-built SingStand 2 is, and how well it performs, not surprising that our reviewers loved it. Having tried this karaoke machine, we can only agree- SingStand 2 is truly the best karaoke machine for most people. Some people might find the lack of a CD drive disappointing, but, unless you already have an extensive karaoke CD collection, you won’t be missing out. Different apps and YouTube are more than enough to keep you entertained. Another potential flaw is that the sound loses quality when turned up to the maximum level, as we’ve previously mentioned. Although it’s nice to have the option to increase the volume as much as you would like without losing quality, we must admit that we didn’t find this very troubling. The highest level of sound before crackling and lower-quality sound is still pretty much high, and considering all the advantages of this affordable karaoke machine, it wasn’t that big of a deal. If you’re willing to invest a little more in your karaoke machine, the Singing Machine iSM1030BT is certainly the best choice. With a modern and elegant design, Singing Machine iSM1030BT looks like a top-notch multimedia system rather than a karaoke machine. In addition to the pedestal which houses the karaoke machine, you’ll get two free standing tower speakers and two microphones, ensuring you won’t have to invest even a cent more to have an amazing experience. This karaoke machine has a 7” LCD display integrated onto the pedestal, so you won’t be obliged to use your TV or iPad to view the lyrics if you don’t want to. However, if you do decide on using your smart device or TV screen, you can easily connect it to Singing Machine iSM1030BT. When it comes to tablets and smartphones, this karaoke machine goes a step further in terms of connectivity- instead of using cables, you can connect your phone or iPad to it by using Bluetooth connection. It also has a built-in cradle for your device, so you can place it over the default 7” display without fearing it will fall down. This way, you can wirelessly stream your music to Singing Machine iSM1030BT, whether from an app or from a website and enjoy the wide variety of choice. However, if you do want to use karaoke CDs, this karaoke machine has got you covered. Instead in limiting itself on just one music source, Singing Machine iSM1030BT offers both connectivity to smart devices and a built-in CD drive, as well as MP3 player compatibility, thanks to its USB drive. It even has AM/FM antenna inside, so when you want to take a break from singing, you can tune into your favorite talk show. When it comes to connectivity, it really has it all, and you won’t be left with one choice only as it’s the case with most karaoke machines. With Singing Machine iSM1030BT you will be able to record your performance on a USB stick, which a really cool function. If you’re curious to hear how you really sound on tape or maybe you want to try your luck as an amateur singer, this feature will be really helpful to you. The twin speakers are not only beautifully designed; they also produce high-quality sound. You can conveniently place them in different positions, ensuring that the sound spreads evenly through the room. They are also very loud, and the quality of the sound is consistent, so feel free to take it up a notch- you’ll certainly enjoy it. Quality speakers combined with sound effects, such as digital key, balance, echo control and auto voice control can make your karaoke night sound much more professional and help you enjoy the overall experience much more, and with two microphones included, you can pair up with your friends and share the fun! If you’re not too keen on having a bunch of different features and just want a simple karaoke machine with a solid performance, you’ll love and Singing Machine SML388W. Easy on the budget and the eyes, this karaoke machine has an interesting, contemporary design and feels like a much more expensive model. Singing Machine SML388W is pretty straightforward, and it operates on the plug-and-play principle. All you’ll need to use this karaoke machine is a karaoke CD of your choice and a TV to follow the lyrics. It’s quite small, and although it holds an edge in terms of portability, the built-in speaker isn’t that impressive. It fares well in moderate volume, but it isn’t the quality of sound like our top pick has. Thankfully, you can connect it to external speakers through aux output, so you can bypass this flaw. When it comes to additional features, Singing Machine SML388W is a modest one. In addition to flashing disco lights, you’ll have auto voice control option and the ability to add echo to your singing. This karaoke machine comes with one microphone included, so you won’t have to invest in additional equipment. The only major flaw of Singing Machine SML388W is that it doesn’t have the ability to connect to smart devices, and it’s only useful if you plan on buying karaoke CDs. However, if this isn’t an obstacle for you, you’ll be very pleased with this little overachiever, and Singing Machine SML388W will certainly be a pleasant surprise. Although adults can use it too, kids seem to find the Singing Machine SML-385W completely irresistible. It’s probably due to the fact its design resembles a toy, with bright colors and a lot of flashing lights, but this cute little karaoke machine also has a surprisingly good performance. Equipped with one microphone, The Singing Machine SML-385W uses karaoke CDs as a music source, so you can rely on music stores to find Disney soundtracks or pop stars that will keep your kids entertained. It has a built-in speaker as well as the ability to connect it to external speakers, but the sound quality is pretty decent, so you probably won’t have to do it. With auto voice control, balance controls and echo effect, you can add interesting effects to your kid’s voice which will engage them even more. It easily plugs into the TV, so it’s safe to assume your living room will be transformed into a superstar stage in no time, but when you see the smile on your kid’s face, it will all be worth it. Compact and unobtrusive, the HDKaraoke HDK Box 2.0 is really worth the top dollar. It will fit into anyone’s home and provide you the ultimate karaoke experience. Compatible with smartphones and tablets, this karaoke machine has its own app with a licensed music library to choose songs from. If you want, you can also install another app or use your MP3 player or USB drive to stream music to the device. You can also use your smart device to control HDKaraoke HDK Box 2.0 remotely, so in addition to high-quality performance, it’s really easy to use. Although it doesn’t have speakers, this device will rely on external devices such as your TV for sound and video, which actually makes it great. You won’t have to be afraid if the sound quality will be up to your standards since you can use the equipment you already have. And for those who like recording, HDKaraoke HDK Box 2.0 has got them covered with their incredibly crisp record function. Portable and lightweight, the Electrohome Karaoke Machine is a great choice for parties. Its compact design makes it really easy to take it with you, so you can bring it to your friend’s parties, too, and keep the fun going. Equipped with both CD drive and output for connection with smartphones or laptops, this karaoke machine can easily adapt to your needs. If you’re up for streaming karaoke songs from YouTube or want to play some CDs from your library, it doesn’t matter- Electrohome Karaoke Machine is versatile and has impressive connectivity. Considering that karaoke machines used on parties can’t have a default music source to rely on, versatile connectivity will come in handy. The internal speakers of Electrohome Karaoke Machine are of high-quality, and the sound volume will be high enough even in a joyous crowd of friends. Although it comes with only one microphone included, it does have outputs for two microphones, so you can upgrade it additionally. Karaoke machines are fun for all ages, but if you want to surprise your grandparents or in-laws with a gift, you can’t miss with the Karaoke USA GF830. Simple to use and of top-notch quality, this karaoke machine is perfect for people who aren’t that tech-savvy as new generations. Complete with two microphones, remote and a 7” TFT color screen, Karaoke USA GF830 will provide entertainment without any hassle. If you want to rely on external video instead of built-in display, all you need to do is to simply plug in your TV and you’re all set. With compatibility for karaoke CDs, MP3 players, and smart devices through aux input, you won’t have any problem when choosing a music source. And, to get you started, this karaoke machine includes a demo disc with 300 songs for your entertainment! For teenagers, a combination of modern design and compatibility with newest technological gadgets is what makes a karaoke machine truly extraordinary, and the Electrohome EAKAR535 will definitely knock them off their feet. Futuristic and elegant design paired with outstanding performance will impress even the pickiest teenager, and the compatibility with smartphones, iPhones, iPads, tablets and MP3 players will ensure that their karaoke machine supports all of their gadgets. In addition to smart devices, Electrohome EAKAR535 supports karaoke CDs as well, so if they want to borrow one of your CDs, this karaoke machine plays them as well. The 3.5” LCD screen might be small, but Electrohome EAKAR535 easily connects to TV, making their karaoke experience truly great. Digital echo and key controls will fine-tune their voice and boost their confidence and auto voice control will help them train their developing singing voice. This karaoke machine comes equipped with one microphone, but two outputs, so, if you want to join in with your kid, you can always purchase an additional one. If you’re a professional, you’ll probably nitpick the performance of every karaoke machine, but the VocoPro JAMCUBE 2 leaves little to be desired. It features built-in multi-format player as well as USB drive and SD card support, and 4 outputs for microphones and instruments, allowing great versatility. It comes with two microphones, so you can start your karaoke experience with a powerful duet or create a couple’s singing contest. Big speaker offers exceptional sound quality, so your karaoke night will be far from an amateur one. In addition to great sound and volume, you can also record your performances to a memory card, and change the key of any song digitally All you need to do is plug in VocoPro JAMCUBE 2 to your TV and let the fun begin. For all Bollywood devotees and admirers of Indian music, Magic Sing ET28KH is a dream come true. With the music source being the built-in music chip, finding your favorite song is easier than ever, and with a library of 1805 Hindi songs and 2001 English ones, you’ll have a variety of songs to choose from. But being specifically designed to cater to people who love Hindi music isn’t the only advantage of this next-gen karaoke machine- it comes with two wireless microphones that act as controllers too, and when hooked up to your TV, it has high-quality sound and video. While you’re watching the lyrics of your favorite tune, you can also see musical notes, in case you want to play, too. In addition to useful features like adjustable melody, tone, echo, and tempo, Magic Sing ET28KH has a unique feature- the Intelli-Scoring system which rates your performance and lets you organize contests with friend and family. With this karaoke machine, you’ll have fun and enjoy your favorite songs, all the while feeling like you’re on American Idol. Q: Are karaoke songs performed by the original artist? A: No. As Ace karaoke website explains, karaoke songs recreate the ones artists originally perform, and even though they sound really similar, they’re not the original songs. Q: What type of discs can I play in my karaoke system? A: Most karaoke machines support VCD, Karaoke DVD, and Multiplex Discs , but the most popular type of karaoke disc is CD+G or CDG. According to information on Karaoke Emporium website, CDG is a standard CD with a graphics layer added, which accounts for the displayed lyrics. Q: Can I play karaoke YouTube videos on my karaoke machine? A: Depending on the model. If you have a karaoke machine compatible with streaming from smartphone or tablet, you can use YouTube as a source for karaoke videos. If you have a karaoke machine that supports only discs, you won’t be able to create a karaoke-compatible one from YouTube disks. However, according to Karaoke-Tutor.com, you can use appropriate software to download and convert YouTube karaoke videos and use them if your karaoke machine has MP3 or USB compatible outlets. Since the ‘70s, karaoke is one of the most loved hobbies and greatest ways to have fun with your friends or family. Nowadays, technology improved karaoke to the extent that you can enjoy a high-quality karaoke experience in your own home. 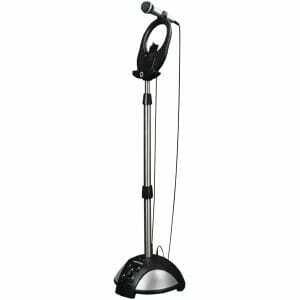 For best overall karaoke machine, our pick is Memorex MKS-SS2 SingStand 2, with affordable price and remarkable performance. If you’re willing to pay a bit more, you can’t go wrong with Singing Machine iSM1030BT, whose features match the ones of professional karaoke. And, in case you’re on a budget, or just want a simple and reliable karaoke machine, Singing Machine SML388W won’t disappoint you. Thanks for putting this up! Given the massive use of roku and other devices and the cost for other karaoke systems I would have thought this would have been much more popular. As for me I’m trying to do this but I’m a little confused (I’m new to this). I have my smart TV (with added external speakers), Roku2, mixer (same as you recommended, arriving tomorrow) and 2-mic system (same as one you recommended). Do I need to buy separate speakers or can I plug everything into the existing system?